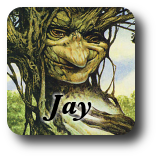 Every day, I design a new card and discuss it briefly. Sometimes I will examine new possibilities for colors or mechanics, sometimes I'll re-examine existing executions and sometimes I'll just design something I think is neat. Note that it's extremely unlikely anything along these lines would ever be printed because there are serious implementation problems. For example, we don't want players to have to ask a judge to check their opponent's deck every time they notice their deck is shy of 60 cards and we certainly don't want cheaters running fewer cards and telling their opponents they're running some number of these. So if these things could never be printed, why discuss them? That's what nerds call fun. *The question that I answered above was tweaked slightly so you'd interpret it the way I did. The actual question was "If a card JUST said, 'this counts as X cards' how big would X have to be?" I'd read the "just" as simple emphasis, assuming that this new ability would be added to a card you might eventually play, be it a utility creature, a narrow answer spell or even just a land. Turns out, it becomes a particularly interesting thought exercise if you take it the way he meant it, which is literally. The card in question does nothing else. You don't want to actually draw it because you won't be able to play it. At X=2, the card is awful. 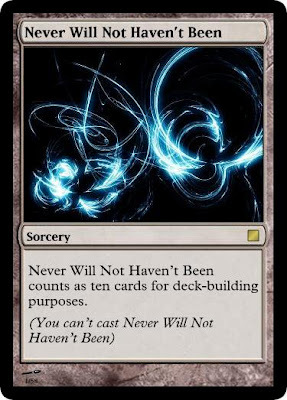 Including one gets your constructed deck down to 59 cards and playing a full playset gets it down to 56 cards, but then you have 4 cards in your deck that are literally unplayable. You can alleviate that cost by running a lot of symmetrical discard effects, but it's still not remotely worthwhile: Your chance of drawing one of the four best cards in your deck in your starting hand rises from 39.9 to 42.3% but your chance of drawing a dead card shoots from 0 to 42.3%. At X=10, you probably only want to play one copy. Doing so increases your chance of drawing one of your four bombs to 45.7% and the chance of drawing your one useless card to 13.7%. The curious thing about this problem is that the value of including some number of these cards in your deck increases as X grows and decreases as X grows because you become more likely to draw your blank card as you become more likely to draw the good cards in your deck. The truly optimal answer for X depends entirely on how many bombs you're looking to increase the frequency of, how negatively you value a dead card, how well you can control the damage of drawing such a dead card and how worried your deck should be about being milled. Of course, for players who can build a six card combo, X=54 would let them build a 7-card deck and get that combo every time. That concludes this post. What follows are some extremely boring probabilities for... uh... who likes probabilities? Just skip this. Really. For what it's worth (not a whole lot), the increase in the chance of drawing one of your 4 best cards finally surpasses the increase in chance of drawing your one useless card around X=26. Player A: I'm casting Jace's Ingenuity. 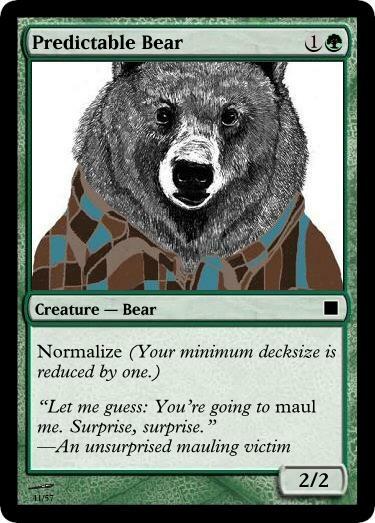 Player B: Okay, it resolves. Player A: Judge! I'm about to draw three cards. 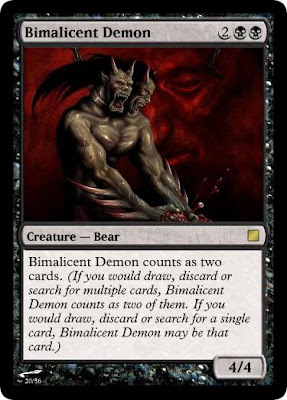 Please verify for my opponent that none of them is a Bimalicent Demon.